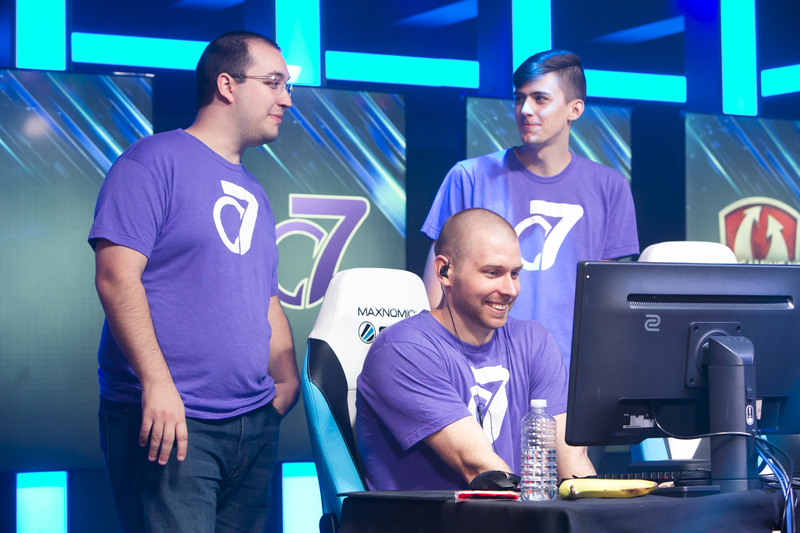 WGLNA Season 2 continues with tight battles for the playoffs. Night 14 of WGLNA Season 2 arrived with most of the attention given to the battle for 2nd place. While Dare Rising could leap into that desired spot with a win, Aquatic M60s boast higher odds and an overall advantage. A win by either o7 or Valence could have massive consequences as well. If o7 dropped the match and Valence were victorious, they could ascend to the 6th place playoff spot. With so much on the line, all of the teams were ready to kick the night off right. Both teams came in with a 10-day gap from their previous match day. However, it was o7 who faced the most challenges following their last match. With the loss of Ledif, o7 responded by picking up veteran caller and strategist, ArcLit. ArcLit brings a lot of experience to the table from his time spent with teams like School Bus, eLevate, and High Woltage Caballers. Here, ArcLit started the first map, Cliffs, along with one of the best faceoff artists in the WGLNA, MeadowHawk. Match 1 saw o7 suffer a few early losses, and in the end, Aquatic M60s wound up making the most of their team by ramming Makos off the hill into the water to take the win and a 1-0 lead. The second match on Cliffs had similar results, and at the map change to Prokhorovka, M60s held a 2-0 lead. However, this would not last, as o7 pushed right down the 1/2 line using WZ 111 1-4 and its armor to gain an early advantage. After a few minutes of reloading and positioning, o7 cleaned house and took the match back, setting the score at 1-2. The pendulum of momentum swung back over to Aquatic as they not only won the second match on Prokhorovka, but also found a way to break o7’s defense on Murovanka and hold the match point at 4-1. With the odds of a defensive win on Muro at over 67% things weren’t looking for o7. However, Aquatic suddenly found themselves down tanks, doing what WGLNA Caster Randall “Ruukil” Holcombe calls “mismanagement” which included Felix killing his teammate Vegi by accident. Taking full advantage of this situation, o7 claimed their second win of the night, making it 2-4. In the end, Aquatic quickly found their feet on the next map, Himmelsdorf, taking the match and the series win 5-2. This victory guarantees Aquatic at least 5th place, and perhaps even a higher spot thanks to the two matches that remain. On the other side, o7 now has to wait until the next match to see if they will wind up in 6th or 7th place. Both teams had nail biting matches on this match day. Valence defeated Rival 5-4 and Dare Rising lost by the slimmest of margins with a score of 4-5 against eClipse. While the first map, Ghost Town, appeared to give Dare an edge due to their past performance, it was Valence who demonstrated solid strategy and some great play as they took the 1-0 lead. On defense, Valance’s BlitzWolf would land a massive shot from his FV215 183 “Death Star” onto Aggressor, deleting him in the process. This would spell the beginning of the end as Valence would get a second win, leading 2-0. The next map would be Steppes, and this time Dare Rising came out in a definitive manner. Nationwide would get boosted up on the north side of Cap Two, reigning down disruptive fire for most the match. Combine this with more than 1,800 damage from Chase_potato’s arty, and Valence were quickly defeated, bringing the score to 1-2. The second match on Steppes would continue this trend. Dare Rising would be more than ready on the defense to tie up the score 2-2. In the first battle on Ruinberg, Valence attempted an aggressive north rush. However, due to some accurate fire on Dare’s part, Valence found themselves down almost five thousand hit points in the first 90 seconds. From that point on it was cleanup for Dare Rising, as they would take a 3-2 lead with the win. The second match on this map would be much tighter as both teams traded HP lead back and forth. In the end, Dare rising would take the match and hold match point at 4-2. Murovanka would prove to be a quick battle as Dare Rising simply dominated, taking the win and the series in just two minutes and thirteen seconds. We caught up with Chase_potato afterward to hear his thoughts on the match. After an exciting night of play, Dare Rising now holds 2nd place. However, with just four match days left and only two matches remaining for each team, the race for 2nd is far from over. 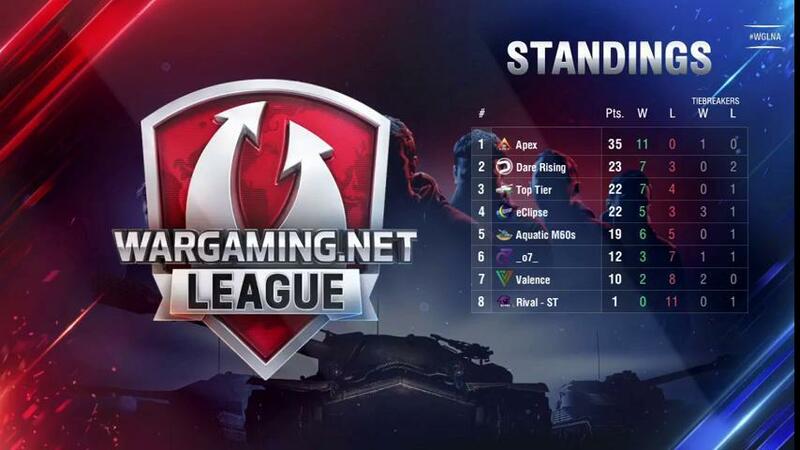 Be sure to tune into the Wargaming League website on Thursday evening for even more WGLNA action.